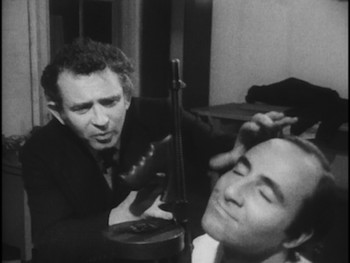 By the late 1960s, Mailer was ready to pick up a camera himself, and in three years, he starred in and directed three films, collected here as Maidstone and Other Films by Norman Mailer, part of Criterion's Eclipse series. 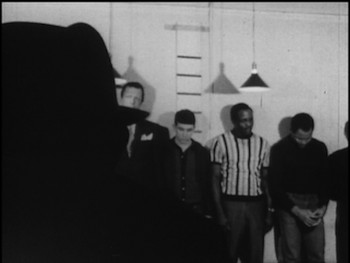 It's Cassavetes that these efforts most resemble--the high-wire act of improvisation, the rawness of the portrayals, the formless construction. 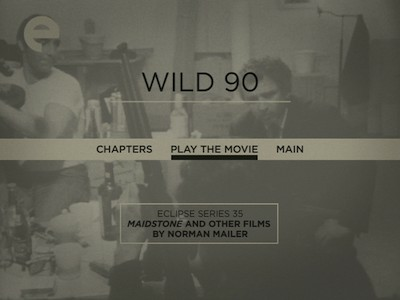 While Mailer's first effort Wild 90 (1967; 81 mins.) 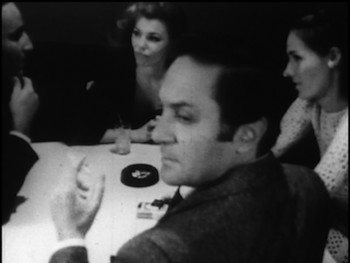 was reportedly a response to Andy Warhol's films (which Mailer found dull), it more recalls Cassavetes' Faces in its limited space and how it depicts a collection of drunks whose party has gone wrong. Wild 90 is essentially the three hoods sitting around a table drinking and carping at each other. Since there is no script, there is also little direction to the conversation. There's a lot of repetition, a lot of posturing, and not much of real substance. Mailer is embarrassing as the heaviest heavy, whom, in a self-aggrandizing move, he has named Prince. 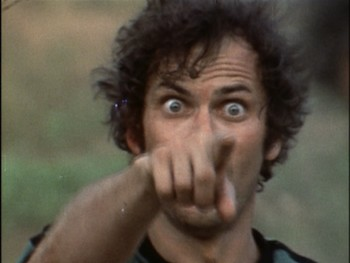 The auteur's "performance" consists of him mumbling, grunting, and swearing. It's mostly incomprehensible. At times, you can see Mailer using his ranting to "direct" the others, bullying them in the way he wants to go, though never ending up anyplace all that interesting. Wild 90 is a crudely made picture, shot in a small space on black-and-white film by D.A. Pennebaker (Don't Look Back), who also appears on screen as one of the cops. The only sequence that comes to anything is when Beverley Bentley (a.k.a. the fourth Mrs. Mailer in real life), playing Prince's girlfriend, provides a challenge to the men's self-satisfaction. Here the nakedness of the production works, but largely because Bentley proves a commanding actress who can anchor and defy all the male egos. Naturally, it doesn't last, with Mailer ending Wild 90 by turning the spotlight back on himself to address the audience directly. I am not sure whom I am more mortified for: myself for having seen this movie, or Norman Mailer for having made it. One of the bikers is played by Rip Torn (The Man Who Fell to Earth, The Larry Sanders Show), who delivers a coarse, musky performance. 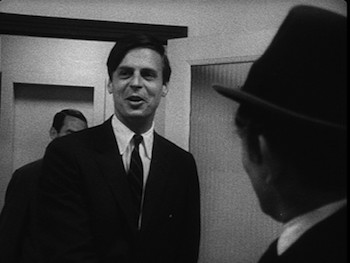 Also notable is an appearance by writer George Plimpton, who is quite effective here as the Mayor. He is stopping by the precinct to question charges of unfair behavior and examine Pope's methods. The frank and unscripted manner in which the cops and the crooks interact transcends most similar genre pictures, and unlike Wild 80, actually generates a potent sense of realism. It also helps that Mailer chooses to explore material that mainstream pictures would never touch--homosexuality, sadomasochism, and pedophilia--amongst the more expected criminal behavior. 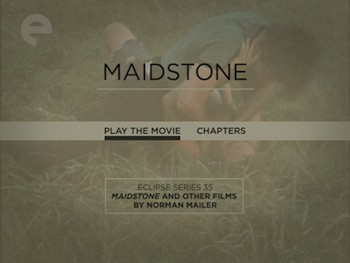 All three movies in Maidstone and Other Films by Norman Mailer are shown at a 1.33:1 full frame aspect ratio. 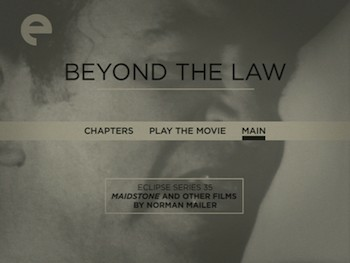 The earlier films, Wild 90 and Beyond the Law, are both in black-and-white. They show the most wear in their source materials, with lots of scratches, flickers, and other glitches. These are understandable flaws; the movies were made on the cheap in the late 1960s and so have not been preserved with the same care as more mainstream motion pictures. The look of the transfers actually fits the spirit of the endeavor: the viewing experience fully replicates the feeling that you're seeing something from the "underground." Maidstone is in color and it is in far better shape. Marks on the print are minimal, and the colors are true to the film stock from the era. There are some jagged edges here and there, a small byproduct of the move to DVD, but overall, it's a decent looking disc. All of the movies have monaural mixes. The nature of the on-the-go audio of the earlier movies means the sound quality varies. Mumbling actors captured live and no overdubs--well, you may want to have the subtitle button at the ready to turn on the Closed Captioning. Again, this is less of a problem in Maidstone. Most of the kinks have been ironed out by the third time around the block. The Eclipse Series 35 box is like the previous series entries: individual slimline cases packed in a cardboard slipcover. Each case has printed liner notes written by Michael Chaiken. They are well worth a read to get the backstory on these oddball films; Chaiken applies an illuminating critical perspective to the final product. Maidstone and Other Films by Norman Mailer, the 35th entry in the Eclipse series, is a trio of films more interesting for what they represent than how they actually turned out. I give Norman Mailer credit for going at moviemaking whole hog, even if he does end up proving he should have stuck to prose. (It would be another 14 years before he was able to make another film, and by all accounts Tough Guys Don't Dance is another turkey.) His experiments at improvisation were intended to get at some unfettered truth, and at times, particularly in Beyond the Law and Maidstone, that actually happens. Unfortunately, in both cases, once Mailer has the truth in his hands, he doesn't know what to do with it. You can run with a ball as long as your lungs allow, but unless you figure out where the goal posts are, it's not really worth it. Rent It.